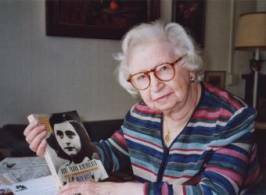 Miep Gies, who died on January 11 aged 100, was one of a Dutch couple who hid and sustained the family of Anne Frank for more than two years in an Amsterdam attic; later she helped to save Anne Frank’s diary for posterity. She was born Hermine Santrouschitz on February 15 1909 into a German Roman Catholic family in Vienna, but was sent to the Netherlands when she was 11 to escape the food shortages in Austria. The family with which she lived in Leiden gave her the nickname Miep and later adopted her. By the outbreak of the Second World War she was working as an assistant to Otto Frank, the owner of a pectin manufacturing company in Amsterdam. After the Nazi invasion of 1940, Frank prepared a secret annex behind a swinging bookcase in a room above the firm’s offices at 263 Prinsengracht; and in July 1942 the family of four – Otto, his wife Edith and their daughters Margot and Anne – went into hiding, leaving a false trail indicating that they had fled to Switzerland. Soon afterwards they were joined by other Jews, the van Pels family and Miep Gies’s family dentist, Fritz Pfeffer – eight people in all. For two years Miep Gies and her husband Jan, a municipal employee whom she had married in 1941, risked their lives to smuggle in food and provisions and news from outside, begging, buying and bartering what they needed from farmers and shopkeepers. They were helped throughout by her colleagues Victor Kugler, Johannes Kleiman and Bep Voskuijl. Miep acted as a confidante for the adolescent Anne, bringing her paper for her diary and, on one occasion, a pair of second-hand high-heeled shoes. The Gies’s heroic feat of humanitarianism ended on August 4 1944, when the Frank family were betrayed (by a person whose identity remains unknown), arrested and sent to concentration camps. When the Gestapo arrived, Miep Gies was at her desk in the office below. She recognised from the voice of one of the arresting officers that he was Viennese, and she managed to charm him, perhaps saving her own life. She never saw her Jewish friends again but ”could tell from the sound of their feet on the wooden steps that they were coming down like beaten dogs”. Later, at considerable personal risk, she went to Gestapo headquarters to try to bargain for their release – but to no avail. Eventually she returned to their hiding place and found Anne’s diary, its pages scattered over the floor. She intended to return it to its author, knowing how important the diary had been to her, and locked it away without reading a word. Nearly a year later, Anne’s father Otto returned from Auschwitz. He knew his wife and friends had not survived, but still hoped that his two daughters, Margot, 18, and Anne, 15, had been spared. Two months later he received a letter that confirmed that both girls had died in Bergen-Belsen in March 1945, less than a month before the camp was liberated by British soldiers. Eventually published in 1947, The Diary of Anne Frank became, after the Bible, the best-selling non-fiction book in the world. For two years she resisted all Otto Frank’s efforts to persuade her to read his daughter’s diaries, but eventually relented and was glad that while Anne had invented pseudonyms for everyone else, Miep’s name was unchanged. She was decorated by Queen Beatrix of the Netherlands for her heroism and dedication and the Israeli Holocaust museum Yad Vashem bestowed on her the title of ”Righteous Gentile”. She was also honoured by the German government. On August 4 every year, the day of the arrest, Miep Gies would shut herself away in her house and see no one. ”I act as though the day does not exist. It is my personal memorial to my people,” she explained. In 1996 Jon Blair’s film Anne Frank Remembered won an Oscar for best documentary feature. Blair took Miep Gies to the ceremony in Hollywood, and as they were on their way to the awards in their limousine she remarked that she had agreed to come because Anne Frank had always wanted to be famous, and that she had loved Hollywood. Blair took Miep Gies on to the stage when he made his acceptance speech, and the audience gave her a standing ovation. Jan Gies died in 1993, and she is survived by a son. Previous article: Tribute to John XXIII from a Nobel Peace Prize candidate.